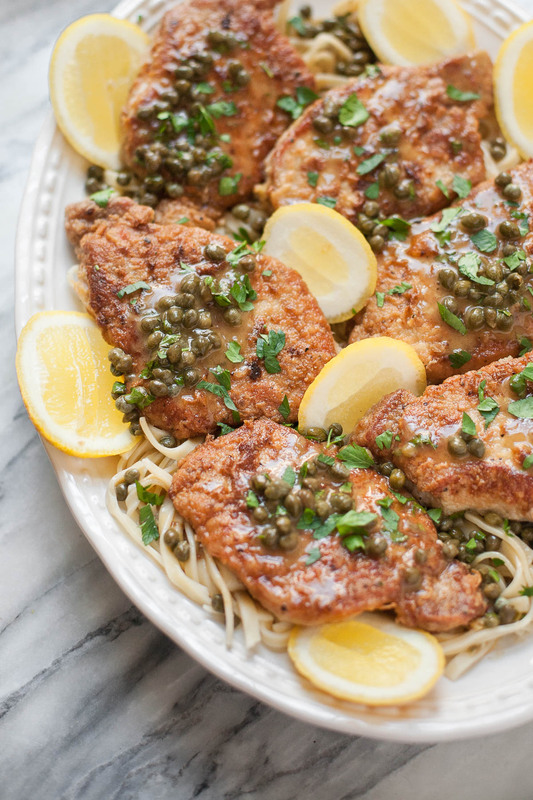 This paleo pork scaloppine with caper butter sauce is like chicken piccata, but better. 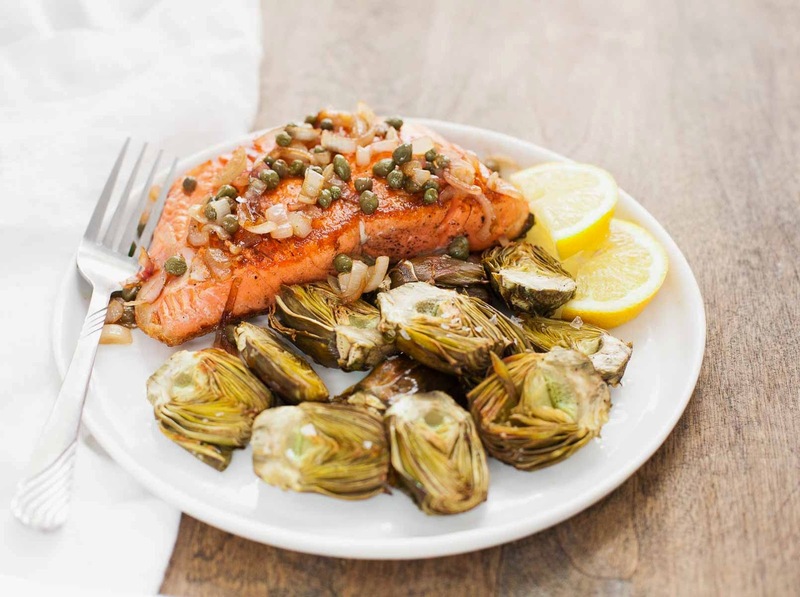 It comes together in half an hour so you can enjoy it on busy weeknights! Monday has reared its ugly head once again. If you’ve got a case of the blues, I have just the thing for you: paleo pork scaloppine. In a mere half an hour, you’ll get to work out your aggression pounding pork chops thin, hear the satisfying sizzle of the meat hitting the pan, pour an irresistible caper butter sauce over a platter of golden brown cutlets, and then dig in. I know I couldn’t ask for a better form of Monday therapy! To make the breading for this paleo version of pork scaloppine as close as possible to the real thing, we’re using Otto’s Cassava Flour (that’s an affiliate link–I love their product and accept no substitutes!). It’s the best one-to-one replacement for wheat flour that I’ve found, and while I used to have to order it online, this past weekend I spotted it at the Chattanooga Whole Foods! To celebrate, I whipped up a big batch of this paleo pork scaloppine. 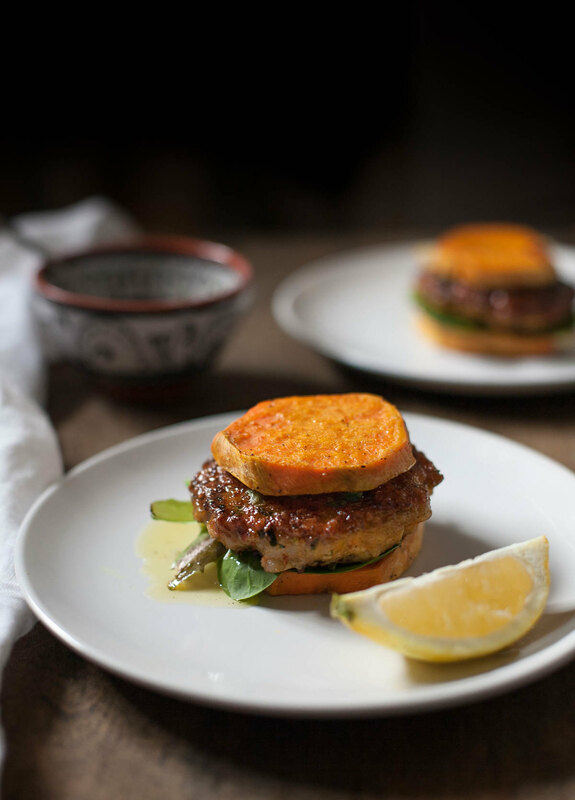 These paleo shrimp burgers are a delicious and fun alternative to regular burgers, and are especially tasty on a sweet potato “bun”with lemon caper relish. Three years ago Ben and I went to Jamaica and fell in love with the island’s food, weather, and laid-back attitude. 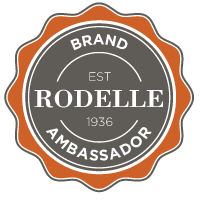 (You can read about our trip here and here–but be warned that there are some bready photos, though, since that was before I discovered paleo. There are also crocodiles and caves!) One of the dishes I really enjoyed was a conch burger. It’s a seafood burger made with the succulent meat from conchs, which are giant marine snails. They’re hard to come by here in Chattanooga and I wasn’t sure how many of you would be excited about a snail burger, so I made shrimp burgers instead. I’ve actually been working on this recipe on and off for over a year. First I had to perfect the burgers themselves. While all my attempts were delicious, I made multiple versions last year that completely fell apart when I tried to flip them. I ended up serving Ben and myself what was basically a pile of shrimp hash. It tasted so good that I almost leaned into it and changed the whole concept of the recipe, but in the end I really had my heart set on these being burgers, so I persevered. I took a few months off because I was tired of defrosting shrimp and removing their tails. It really isn’t that hard, but after a while it can be a pain. Once it didn’t seem daunting anymore I jumped back in, and finally discovered the two keys to making sure these burgers stick together. First, you need to use a food processor to blend the ingredients, and second, the patties need to chill in the fridge for a bit before you cook them (that key tip is from America’s Test Kitchen via The Frugal Girl). 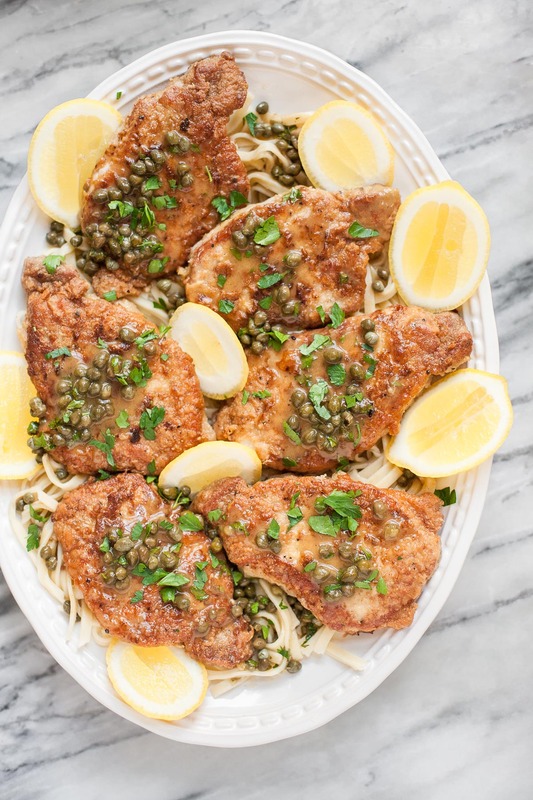 This paleo chicken piccata is an easy, quick, and super flavorful weeknight dinner. 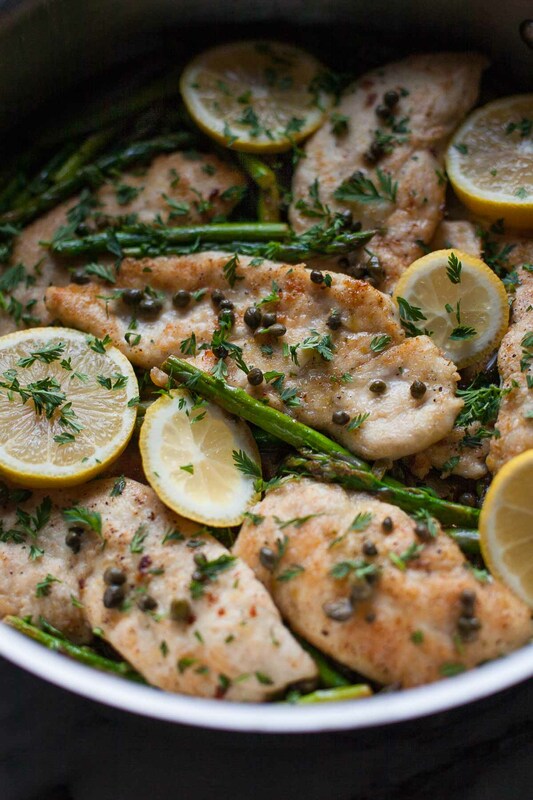 Adding asparagus makes the already delicious combo of chicken, lemon, and capers even tastier and more nutritious. Do you see those little green leaves gracing the top of this paleo chicken piccata? Can you guess what they are? If you guessed parsley I can see why, but they’re actually carrot tops. Yup, as in the lengthy greens that sometimes come with a bunch of carrots, making the whole shebang almost impossible to fit into one of those little produce bags at the grocery store (I’m not the only one who has trouble with that, right?!). That’s probably enough about the garnish, though–let’s talk about the paleo chicken piccata itself. This dish is so easy to make. 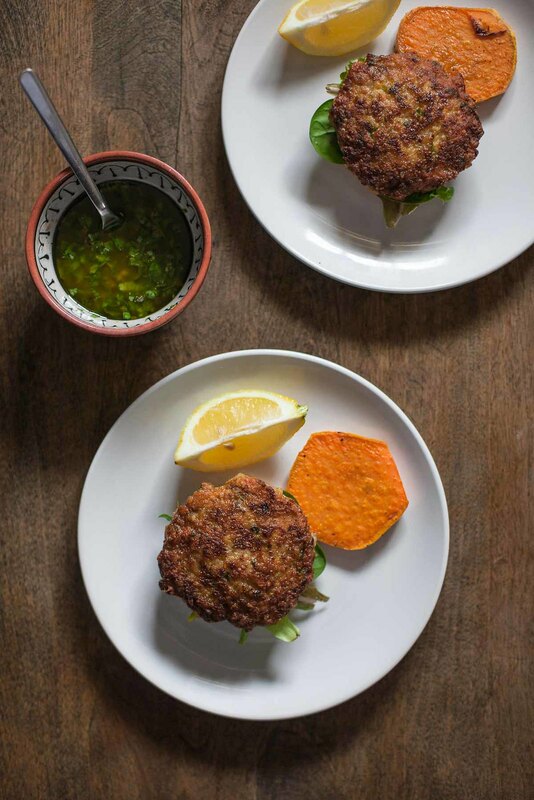 Basically we’re pounding out chicken cutlets to make sure they’re nice and thin, dipping them in some seasoned tapioca flour, and pan-frying them in ghee and olive oil until they’re golden brown. Next we’re quickly steam-sautéing some asparagus in the same pan and making a quick sauce with chicken stock, lemon juice, capers, and a little more ghee or butter. That’s it, and dinner is served! 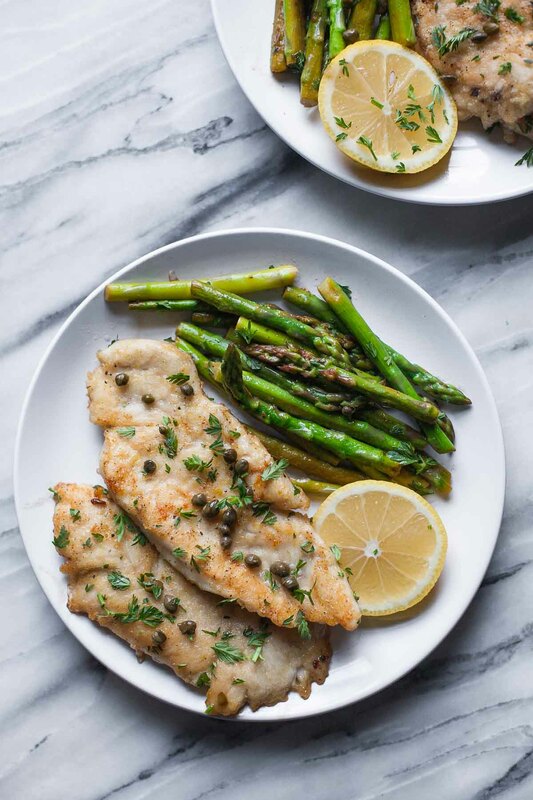 I sometimes find chicken piccata too lemony, but the asparagus and ghee add some richer, earthier flavors here so that the balance of tart and savory tastes is just perfect. This Italian summer grilling post is sponsored by Colavita. To me, a mixed grill is the epitome of summer eating. 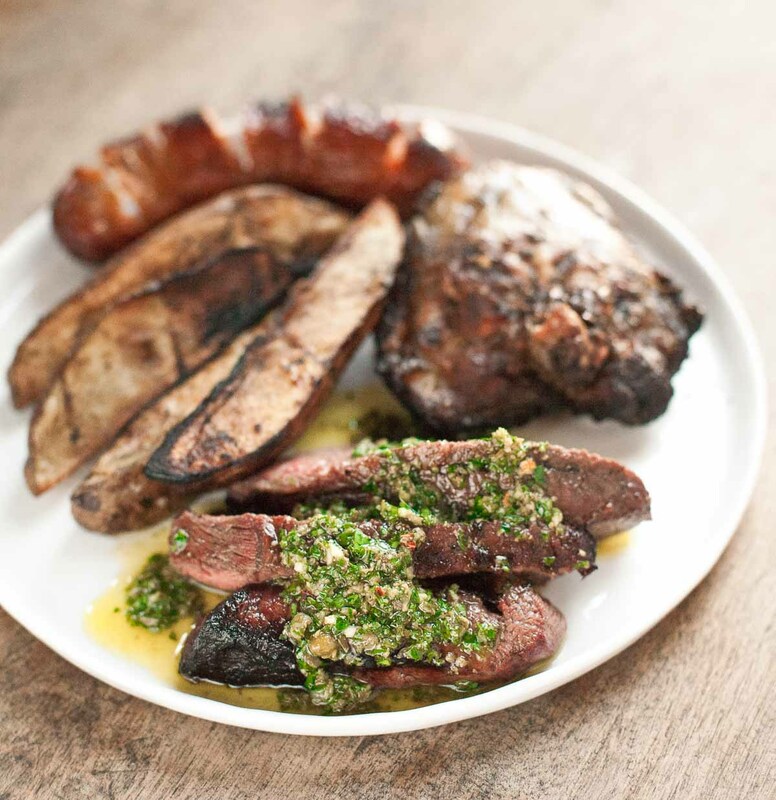 When I spent a semester in Buenos Aires during college, I loved to go out with friends and order a parrilla mixta, which usually consisted of grilled steak, chicken, chorizo, and often organ meats as well, with a big bowl of herby chimichurri sauce and an even bigger bowl of french fries on the side. Add a bottle of wine and you have yourself one happy evening! I don’t know why it took me so long to recreate a parrilla mixta at home, but when Colavita asked me to write a post on the theme of Italian summer grilling, this was the first thing that came to mind. Here I’ve given the Argentine parrilla an Italian twist, marinating the steak and chicken with Italian seasonings and adding capers to the chimichurri. 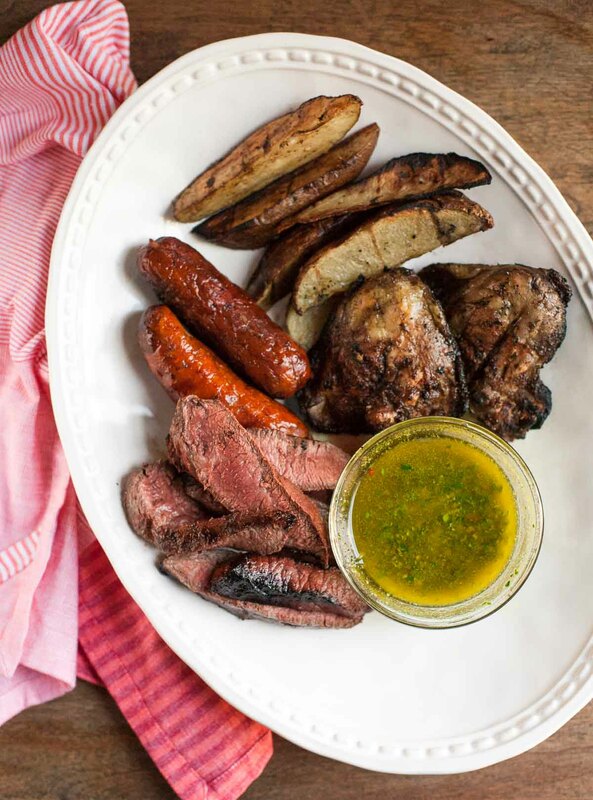 Argentine cuisine is heavily influenced by the food of Italy to begin with–even the Spanish spoken in Buenos Aires sounds uniquely reminiscent of Italian–so Colavita’s oils and vinegars work really well with all the components of this South American meal. Were you a picky eater as a kid? I was pretty much the worst. The only vegetable I would eat was broccoli, and it had to have cheese on top. Everything else I deigned to consume was white or golden brown in color: chicken fingers, macaroni and cheese, grilled cheese, french fries, and pizza without tomato sauce (read: dough with cheese). I wanted slices of American cheese melted on top of almost all my food. It was actually called “Becky cheese” over at my dad’s, where no one else ate it. I remained picky through high school, when I invented a white pizza with broccoli and two kinds of cheese at my favorite local pizzeria. My friends and I called it “Becky pizza”, and it was fabulous (I still think something like it should be added to the menu). I’m proud to say that things have really changed. Today I’ll try almost anything, and there are very few foods I don’t enjoy. However, until a couple of months ago, salmon was still on my “no” list. I found it too fishy, and something about its orange-pink hue didn’t sit well with me. Recently I worked on a project where I had to make several salmon recipes. To my surprise, I ended up loving them! 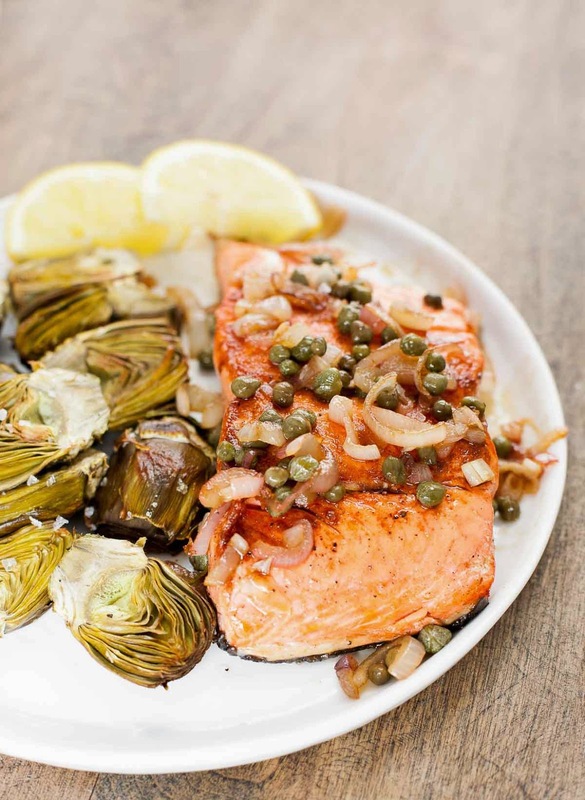 The key for me is to really crisp up the skin (and brown the other side as well) and serve the salmon with a flavorful sauce.